The ultimate guide to Sahoro ski holidays in 2019 & 2020. Head to Hokkaido - the northernmost island of Japan - and slap bang in the middle, surrounded by wilderness in the Hidaka Mountain range is Sahoro. As a ski resort, this one’s a tiddler, that took to the spotlight during the 1972 Sapporo Winter Olympics (the first ever held in Asia). There’s no buzzing ski town or quaint mountain village – just a handful of hotels and restaurants which cleverly cover all you’d need for a week on the mountain and more (the Club Med hotel is moments from the nearest lift). The 9 ski lift system is capable of transporting 12,000 people per hour with the gondola able to take you to the top of the mountain in under ten minutes. But that’s not to say you’re miles from the rest of civilisation… The town of Shintoku is 20 minutes’ drive away with restaurants, shops and the Shintokucho Eiyokujo spa. You’ll find a couple of airports - New Chitose and Tokachi–Obihiro - within a two-hour drive, and there’s plenty to explore all over the island. Hokkaido has a real buzz about it, hosting over a thousand festivals and events throughout the year, which makes it one of the nation’s busiest areas. These include the Sapporo Snow festival in February, drawing around two million visitors to see beautiful snow and ice sculptures. By European standards, the ski area’s pretty small with 17 pistes covering 80 hectares in all on Mt. Sahoro-Dake. But if you’re the kind of skier or snowboarder who likes getting your bearings on familiar terrain, it’s spot on. Meanwhile, those who get itchy feet at the thought of the same runs all week can use Sahoro as a base for a Japanese ski safari including the likes of Tomamu (35 mins away by car) and Furano (just over an hour’s drive). There aren’t dozens of them, but the pistes you can ski here are gloriously groomed twice a day to ensure everyone enjoys the corduroy. The easiest of the beginner terrain can be found in the lower parts of the resort, where the two fastest quad chairs serve green runs - South Road and Central Road are the gentlest out of the 9 available. South Road is short and sweet and Central Road nice and long if you’re looking to build up a rhythm. South Street is the longest of the lot at 2.7km and curves around the edge of the ski area, providing stunning views from the top of Mt. Sahoro-Dake. Sahoro’s three groomed intermediate runs include the North, the Central and Second North Avenue. All reds fork off from the top of the mountain for a top-to-bottom descent to the base - at 3km, North Avenue is the longest and a clear favourite. While the five advanced runs aren’t the hairiest you’ll ever see, the North way is the area’s steepest - with a maximum gradient of 39 degrees it’s often used as a slalom course. Off piste skiing and riding is allowed but rarely practiced, meaning fresh tracks amongst the trees aren’t hard to come by – don’t miss the steep descent to the left of North Way. Freestylers aren’t forgotten, and will find a Snow Park near the bottom of the resort as well as a 120m half pipe. For cross country skiers, there are 5km of trails. The best bars can be found as part of the local hotels, which tend to put on their own evening entertainment. On previous years, we’ve enjoyed the Wakka Bar in the Club Med hotel which has stunning views over the surrounding mountains, transforming into a nightclub from 11pm-2am for night owls. Otherwise, it’s all about activities - go on the Kasumi Waterfall snowshoe trek, looking out for Ezo deer along the way or have a go at tree climbing in the forest using a rope system and harness. Horse riding in the snow is a fun way to explore the surrounding countryside, giving you views of rural Japanese houses, fields and miles of white on the mountains. Ice skating’s also very popular. There’s a real mix of meals available in the restaurants here, which often come included with your hotel accommodation. Look out for local dishes like ‘nabe’, a traditional soup created in front of you where ingredients of your choice are added one after the other. Besides Japanese cuisine, you’ll find ski favourites like fondue and pizza and some incredible Japanese-French fusion dishes. 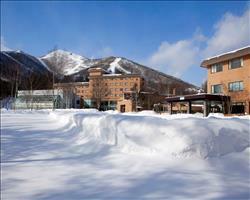 Many decide to head into the town of Shintoku, about a 20-minute drive away, for more choice. This traditional Hokkaido town comes with cosy restaurants like Mintaru, serving local cheeses and Minatoya’s buckwheat noodles are always a popular choice. When is the best time to ski Sahoro? January and February are typically the best months for snow. We like February when Hokkaido is buzzing with some of the island’s largest festivals taking place, including the Sapporo Winter Festival which brings 2 million people to the area! The pistes here are sheltered from big gusts of wind as a result of its defensive-tree-line, which also provides better visibility during times of heavy snowfall. Sahoro tends to wind down in early April with the quality of the snow usually starting to deteriorate from around the end of March. Local hotels often put on special events and incredible feasts to celebrate Christmas in Sahoro. Start the year slightly differently by waking up in the Hidaka mountains during New Year in Sahoro. The Japanese and Australian families that love skiing here don’t have the same school holidays as British schools, making Half Term in Sahoro wonderfully quiet. Families are welcomed with open arms here, with all-inclusive hotels that have thought of everything (multiple restaurants, family rooms, activities galore) to make a week with the brood amazing. Those who haven’t clipped into skis before will learn on incredibly groomed pistes in a ski area small enough to navigate easily, while more experienced family members take to the snow park and halfpipe. Look out for packages including ski lessons, childcare and evening entertainment for a fun and relaxing trip all round. If you haven’t skied Japan before, it makes for an amazing place to experience as a group. Saharo has a different vibe to the big European and North American resorts you might be used to – with a smaller ski area and drinks and dinners hosted in the big hotels. But that’s not to say you’ll be at a loss of things to do – if your party end up wanting something other than the 17 runs here, there are more Hokkaido ski resorts within easy reach (including Tomamu and Furano) as well as all manner of local activities from snowshoeing to lazy spa days. Spend time together feasting on Japanese and European cuisine, and making the most of all-inclusive drinks deals in the local hotels.